You probably spend a lot of time in your kitchen and that’s why the color you choose for your cabinets is so important. So which is a better choice— should you paint or refinish your wood kitchen cabinets? Two of the most common methods to update kitchen cabinets on a budget are painting or cabinet refinishing. Let’s find out what makes cabinet refinishing the standout choice. Cabinet and wood refinishing services can dramatically change the style color feel of a kitchen and other rooms. It is also much more affordable than cabinet refacing or replacing. While a more cost-friendly option, wood refinishing done correctly can protect, rejuvenate and allow your wood to endure generations of use. Pros: Cabinet refinishing enhances rather than hides the character of natural wood grains, plus restores color and corrects blemishes for an affordable price. And his method can be completed quickly compared to other methods. Cons: Cabinet refinishing is limited to more natural tones than a painted cabinet. However, it adds more dimension to a kitchen than a solid cabinet can. Pros: Cabinet painting gives the option to choose from a variety of colors like blue, green, or white. The latest trends seem to be painting kitchen cabinets a beautiful neutral color. Cons: Trends constantly change and once you paint your cabinets, it’s hard to go back. Cabinet painting can be very costly and takes more time to complete. Plus, it conceals natural wood cabinets—hiding the grain and character. You’ll also have to consider things like the paint chipping or dull spots potentially developing over time. Choosing cabinet refinishing is a timeless style choice and you won’t find yourself regretting it in a few years. 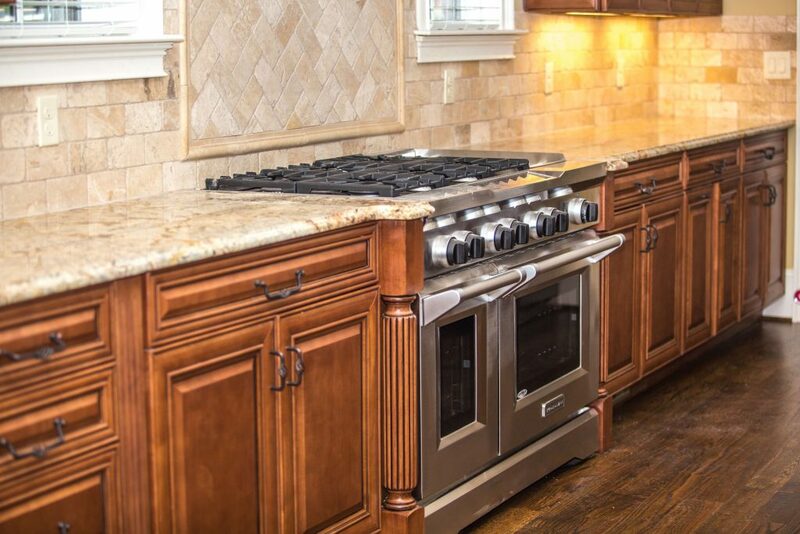 Cabinet refinishing and restoration is a stand out choice for those looking for an affordable method. Refinished cabinets also add dimension and texture for a beautiful, natural look. Contact WoodWorks Refurbishing today to get started on your cabinet refinishing project in Centerville, Utah! This entry was posted in Kitchen, Refinishing, WoodWorks and tagged cabinet refinishing, centerville cabinet refinishing, kitchen cabinet refinishing, wood renewal.